Fall and football season are already in full swing, and I can’t stop fantasizing about Super Bowl foods! With buffalo wings using being one of the key dishes on any Super Bowl Sunday table, I decided to try out a lighter, healthier take on that popular recipe. 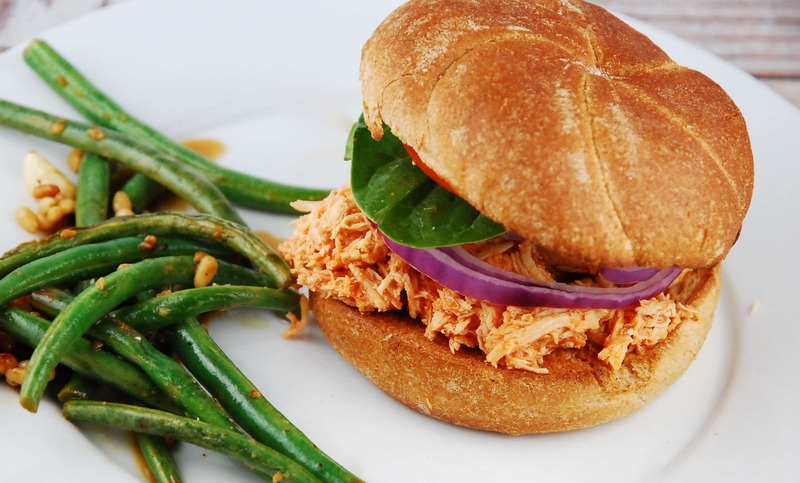 My Crockpot Buffalo Chicken Sandwich is not only super easy to make, but because it uses skinless bombers breasts, it’s way lighter and healthier than the wings. Plus, it’s a lot less messy. And making a sandwich out of the meat makes it a much more filling food. If I have an extra Point or two to spend, adding a tbsp of blue cheese dressing to this sandwich is absolutely DELISH, and I highly recommend it.For this recipe, you’ll want to use whole wheat buns that are around 90 calories each. These Weight Watchers crockpot recipe couldn’t be easier. Tender, juicy chicken breasts are shredded and warmed in spicy buffalo wing sauce to make. Add to your favorite whole wheat bun for the most amazing chicken sandwich. Cook chicken in crockpot on high for 3-4 hours or on low for 5-6 hours. Once chicken is cooked, drain juices from the crockpot and shred chicken with two forks. Then add the butter and RedHot sauce, mix well, and cook on high for another 30 minutes. Spoon chicken onto a toasted hamburger bun, and top with lettuce, tomatoes and red onions if desired. Sounds delicious but won’t the chicken stick with no added liquids or oil. Let me know.